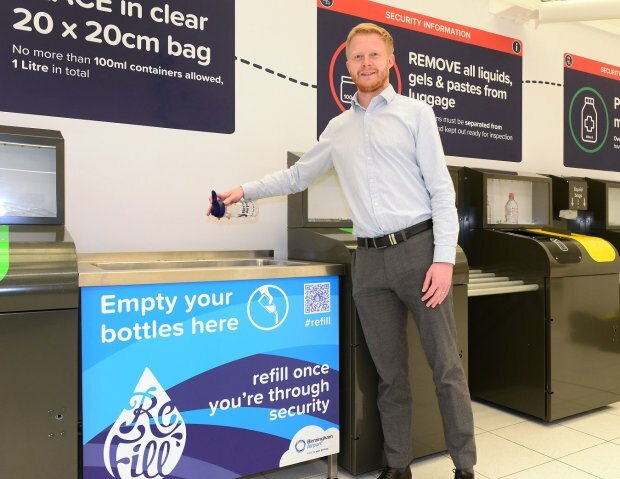 Birmingham Airport has joined forces with Severn Trent and City to Sea on the national ‘Refill’ scheme to encourage passengers to reuse their water bottles rather than disposing of them at the security search area. With thousands of water bottles being disposed of each year by passengers unable to take liquids through security, the airport has installed a new water station adjacent to the main security search entrance area for bottles to be emptied and refilled after security at any of its bars, cafes and restaurants. Birmingham Airport becomes one of the first major UK airports to join the Refill scheme, which also provides a free to download mobile app for users to search for the nearest free refill point in their vicinity. Water company Severn Trent, in partnership with founding organisation City to Sea, has rolled out a number of action days in major cities across the Midlands in recent months, encouraging cafés, bars and restaurants to sign up to the nationwide Refill scheme. Chantelle O’Sullivan, a Refill scheme ambassador for Severn Trent, said: “The launch of this new water station at Birmingham Airport is great news for the environment, as well as passengers passing through the terminal. It means passengers can enjoy Severn Trent’s wonderful water by filling up their reusable water bottles for free, from bars and restaurants that have signed up to the scheme, without the worry of having to leave their drink behind once they reach security. We hope it will encourage more people travelling from the airport to keep hydrated, as well as reduce the environmental impact of plastic water bottles. All of Birmingham Airport’s on-site café, bars and restaurants provide free water to customers on request. The Refill app can be downloaded for free on Google Play or via the App Store. Anyone wanting to get in touch, find out more about Refill, or those looking to sign up or become an ambassador for their local area, can email refill@severntrent.co.uk.